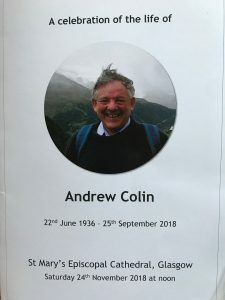 A number of us attended the Thanksgiving Service at St Mary’s Cathedral for the life of Andrew Colin. He and Veronica were members of the Cathedral congregation for many years and Andrew was also a loyal member of the choir. After moving home, in recent years Andrew and Veronica have attended St Andrews and participated very actively in the worship and life of our church, with Andrew continuing to be a valued member of our own wee choir. Yesterday’s service was a wonderful celebration of his life, both in music and words, his brilliant academic career and work in Computing and Sciences lasting many decades which even resulted in gaining a PhD in quantum physics in retirement, his love of walking and climbing Munros and also his family life as a husband, brother, father and grandfather. Andrew was an inspiration & will be very much missed by all who knew him. Our prayers are with Veronica and his family.